Binoculars for Kids | Best binocular Reviews for birding hunting And Stargazing ! Binoculars open up a whole new world to kids and children. These allow them to see closely and deeply the beauty of nature. Along with their innate curiosity and imagination, the possibilities for their growth and development are endless. When buying a pair for your child, there are some things that you should take into consideration. 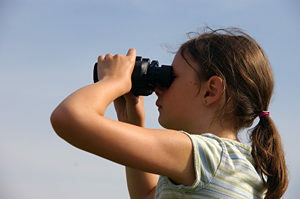 Take a look at some of the important factors to consider below so that you would know the perfect binoculars for your kids. Do not choose those binoculars that are heavy and bulky. Since kids have smaller hands, they should use those that are in proportion to their features. It should be easy to hold and look through. The center focus wheel should be easy to reach and the ocular lenses should line up with the child’s eyes. Otherwise, it will cause frustration and the kids might quickly lose interest with it. While it is logical to opt for the compact binoculars for your child, it may not be the best choice as their image quality and brightness is a little bit low. A mid-size pair may be a better option since it is light enough and produces a good quality image. Binoculars with low magnification, those with 7x or less, are more suitable for kids because they are much simpler to handle. The children will be able to hold it steadily with their hands. Aside from these, low magnification gives you a wide field of view. With this, your kids will be able to easily locate birds and animals and track their motion. When choosing a pair of binoculars, look for those with a minimum of 15 mm of eye relief. This is to accommodate eyeglass wearers. Also, opt for those that come with eyecups that adjust to the individual user may it be child or adult. Invest in a pair of binoculars that is both fog proof and waterproof and one that has rubber armoring and a good warranty. This will ensure that your binoculars will last for a long period of time. Plus, your kids will still be able to enjoy the view as the weather conditions will not affect your binoculars.